A little shop in the heart of the old mining village of Kiveton park, bringing back memories of a bygone era, of when food was proper food with a real homely taste and honest feel. 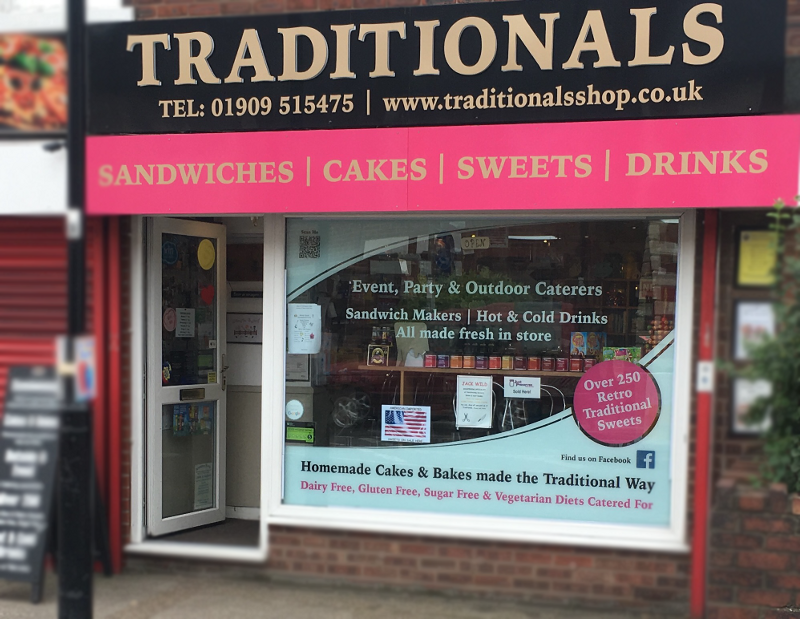 At Traditionals we get very excited about using the best of British, Local foods made with Traditional recipes and methods for everyone to share. We believe that everyone should still enjoy traditional, yet, sometimes forgotten foods and how they used to be and taste, So we are trying to bring all that back, including some with a modern twist. Being classically trained as a chef, and worked in some of Englands finest Hotels and award winning Restaurants, this shouldn’t be hard, along with the passion and determination to provide good food and service. We endeavour to use and support local suppliers and businesses, to help keep the traditions going to supply you the best of British Happy shopping and eating. Husband and Wife team with over 20 years experience in the industry. We stock hundreds of sweets from your bygone days. Classic and Traditional food, everyone’s favourites. All Cakes and Baked items are deliciously made at home. We try to use local suppliers and businesses when possible. We love our customers and always go the extra mile. We offer delivery to your door or pick up in shop. We are constantly stocking new items in our shop and online.